The reactions catalyzed by enzymes have several advantages over those traditional chemical transformations, such as mild reaction conditions, high specificity (selectivity), low cost and environmental compatibility. The judicial selection and use of an enzyme for a reaction can be greatly facilitated by performing a high throughput enzymatic reaction screening with enzyme screening kits. We offer 15 enzyme screening kits targeting different classes of enzymatic transformations. The kit contains 1 mg enzyme, 1.07 mg K2HPO4, 0.52 mg KH2PO4, 0.02 mg NADP+/NAD+, 0.4 mg D-glucose, 0.2 mg glucose dehydrogenase. Control-1 and Control-2 contains 1.07 mg K2HPO4, 0.52 mg KH2PO4, 0.02 mg NADP+/NAD+, 0.4 mg D-glucose, 0.2 mg glucose dehydrogenase. Co-enzyme system for Column 1-9 is NADP+, for Column 10-12 is NAD+. It contains 20 ?-transaminases (ATAs), and is a useful tool to catalyze regio- and stereoselective synthesis of chiral amines, amino acids and their derivatives from a variety of aliphatic and aromatic ketoacids, aldehydes, ketones and ketoses. The kit contains 1 mg enzyme, 1.07 mg K2HPO4, 0.52 mg KH2PO4, 0.0005 mg pyridoxal-5–phosphate, 0.121 mg phenylethanamine. Control-1 and Control-2 contains 1.07 mg K2HPO4, 0.52 mg KH2PO4, 0.0005 mg pyridoxal-5–phosphate, 0.121 mg phenylethanamine. D3 contains 1 mg enzyme, 1.07 mg K2HPO4,0.52 mg KH2PO4,0.02 mg NAD+,0.12 mg ammonium formate, 0.2 mg formate dehydrogenase. It contains 23 ene reductases (EREDs), and is a useful tool to catalyze regio- and stereoselective double bond reduction of a, ß-unsaturated aldehydes, ketones, nitriles, nitros, and amides. EWG = aldehydes, ketones, nitros, nitriles. 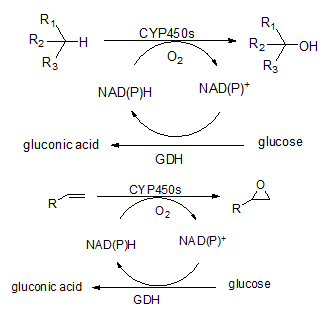 Co-enzyme system for Column 1-3 is NADP, for Column 4 is NAD+. 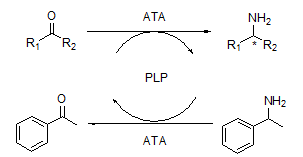 It contains 6 aldolases (DERAs), and is a useful tool to catalyzes enantioselective carbon-carbon bond formation, generating up to two chiral centers under mild reaction conditions. They are emerging as powerful and cost efficient tools for the industrial synthesis of chiral molecules. The kit contains 94 x 1 mg enzyme, 1.07 mg K2HPO4, 0.52 mg KH2PO4. Control-1 and Control-2 contains 1.07 mg K2HPO4, 0.52 mg KH2PO4. It contains 16 Amidases (AMDs), and is a useful tool to catalyze regio- and stereoselective synthesis of chiral carboxylic acids and their derivatives from a variety of aliphatic and aromatic amides. The kit contains 1 mg enzyme, 1.07 mg K2HPO4, 0.52 mg KH2PO4. It contains 24 nitrilases (NHTs), and is a useful tool to catalyze the synthesis of chiral amides through regio- and stereoselective hydrolysis of a variety of aliphatic and aromatic nitriles. It contains 40 nitrilases (NITs), and is a useful tool to catalyze the synthesis of chiral carboxylic acids through regio- and stereoselective hydrolysis of a wide range of aliphatic and aromatic nitriles. 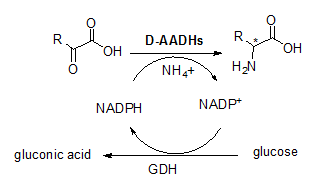 It contains 7 D-amino acid dehydrogenases (D-AADHs), and is a useful tool to catalyze regio- and stereoselective synthesis of D-amino acids from corresponding 2-keto acids with ammonia. The kit contains 1 mg enzyme, 1.07 mg K2HPO4, 0.52 mg KH2PO4, 0.02 mg NADP+, 0.4 mg D-glucose, 0.2 mg glucose dehydrogenase. Control-1 and Control-2 contains 1.07 mg K2HPO4, 0.52 mg KH2PO4, 0.02 mg NADP+, 0.4 mg D-glucose, 0.2 mg glucose dehydrogenase. It contains 29 nitrilases (HNLs), and is a useful tool to regio- and stereo- selective synthesis of (R)-cyanohydrins or (S)-cyanohydrins from a variety of aromatic, aliphatic and heterocyclic aldehydes or even ketones. 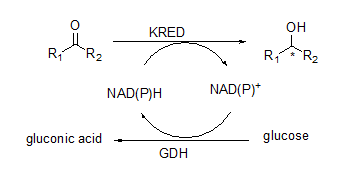 Stereoselective synthesis for Column 1-3 is S, for Column 4-5 is R.
It contains 5 alcohol oxidases (AOXs), and is a useful tool to catalyze oxidation of fatty alcohols or aryl-alcohols to form aldehydes or aldehydes. It contains 2 epoxide hydrolases (EHs), and is a useful tool to catalyze the synthesis of chiral alcohols through stereoselective hydrolysis of aliphatic and aromatic epoxides. It contains 2 formate dehydrogenases (FDHs), and is a used for recycling NADH with ammonium formate as the reducing agent. The kit contains 1 mg enzyme, 1.07 mg K2HPO4, 0.52 mg KH2PO4, 0.02 mg NADP+/NAD+, 0.4 mg ammonium formate. Control-1 and Control-2 contains 1.07 mg K2HPO4, 0.52 mg KH2PO4, 0.02 mg NADP+/NAD+, 0.4 mg ammonium formate. It contains 4 glucose dehydrogenases (GDHs), and is a used for recycling NADH and NADPH with glucose as the reducing agent. The kit contains 1 mg enzyme, 1.07 mg K2HPO4, 0.52 mg KH2PO4, 0.02 mg NADP+/NAD+, 0.4 mg D-glucose. Control-1 and Control-2 contains 1.07 mg K2HPO4, 0.52 mg KH2PO4, 0.02 mg NADP+/NAD+, 0.4 mg D-glucose. It contains 5 cytochrome P450 monooxygenases (CYPs), and is a useful tool to hydroxylate unreactive carbons (C-H activation) or oxidize heteroatoms (N, S, etc.) in the presence of oxygen. It contains 12 nitro reductases (NTRs), and is a useful tool to catalyze the synthesis of amines from corresponding nitro compounds. Co-enzyme system for A1 is NAD+, for the kit is NADP+.